Massage therapy offers a natural conservative treatment approach that, when combined with chiropractic and the other unique therapies in our clinic, works to greatly relieve musculoskeletal pain for many patients. Our office provides private, on-site massage therapy that is tailored to meet each individual patient’s condition. Many of today’s health problems can benefit from massage therapy because the manipulation of soft tissues affects so many of our bodily systems. The benefits of massage therapy are extensive. Massage therapy treatments will have a therapeutic effect and improve health by acting directly on the muscular, nervous, circulatory and lymphatic (immune) system. Massage therapy can relieve or prevent physical dysfunction and pain. It will also relax tight and tense muscles. Many people don’t realize how much a tight muscle impacts on vital things such as posture. A tense muscle can throw off your body’s balance. Before long, muscles that were not initially tight begin to tense as they compensate for other parts of the body. It becomes a chain reaction that can spread far from the initial problem spot. Massage therapy can improve circulation, recovery time and immune system function. The movements of massage cause blood to flush in and out of muscles and joints. The flushing process-enhancing circulation in the affected areas and can, in some cases, aid recovery time from injuries. Massage therapy can reduce overall stress. We’re all becoming more aware of the role stress plays in health. People who are stressed, all other things being equal, are less healthy than people who are relaxed. Stress, for example, increases the risk of heart disease. Massage therapy is an effective and enjoyable way to reduce stress. Massage therapy is also effective in the control of pain, chronic or acute, in stress reduction, and in creating a sense of relaxation and well-being. A licensed, skilled practitioner can become an important and integral part of your life. 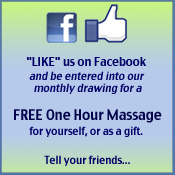 We offer therapeutic massage to chiropractic, physical therapy and acupuncture patients, as well as the general public. All of our therapists are licensed and Certified Therapists and are members of the American Massage Therapy Association, AMTA. Half/Hour and Full/Hour appointments are available Monday through Friday. Gift Certificates are available. Insurance does cover massage therapy in our office for many patients. Give our Woodbury | Waterbury area chiropractic office and our staff will verify and explain your coverage to you, at no charge.